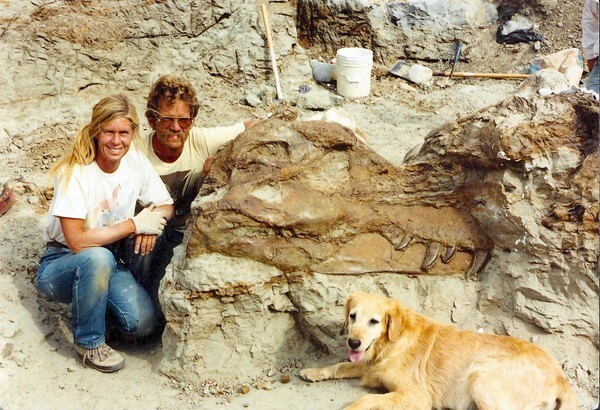 On 12th August 1990 Susan Hendrickson discovered a new specimen of T. rex in South Dakota, bringing total number of known specimens to 9. 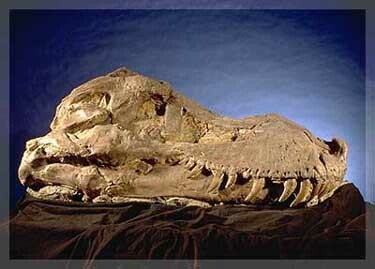 The specimen, nicknamed Sue, was at least 70% complete, and was the largest ever found. 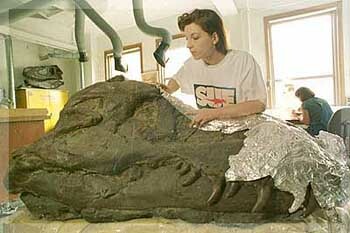 ( The second largest specimen was also found in 1990). During excavation some interesting features were found - it had a badly broken, and healed, left leg. 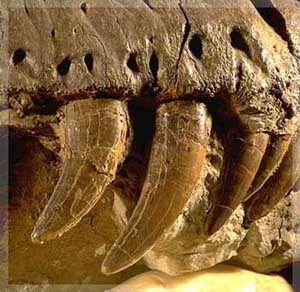 Also a crushed and healed tail, a broken and improperly healed rib, and a very malformed tooth indicated an injury to the jaw, and a bite to the neck from another T. rex with a tooth still embedded - this was an old female which had led a rigorous and somewhat nasty life. The various displacements and imperfections of some of Sue's bones reveal quite a traumatic life. For example, 2 tail vertebrae are fused together for reasons unknown. Abnormal growth on one side of a tail vertebra may have been caused by disease. Sue's left fibula had been deformed by what was probably an infection. The specimen had been discovered on a Sioux Indian reservation. Although the landowner had been paid $5000 for the right to excavate, tribal leaders claimed ownership of the specimen and asked the federal government to investigate the legality of the operation. The conclusion was that the federal government owned the specimen, and a dawn raid was mounted by the FBI on 14th May 1992. 35 FBI agents arrived at the excavation site with a search warrant and crated up all 10 tonnes of skeleton and took them away. For a further 12 hours, 9 FBI agents removed all research material, photographs, illustrations, business records, address books etc., a total of 50,000 documents. Further studies of this important specimen were therefore in limbo. 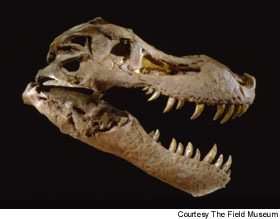 The specimen was bought in 1997 by the Field Museum , Chicago, with financial help from McDonalds, Disney and California State University. Click here to view the National Geographic Magazine article on discovery of Sue. Having been bought by the Chicago Field Museum, Sue was housed at Phil Fraley Productions, a fine art foundry outside Trenton, New Jersey, where reconstruction has been taking place. Here, sculptors and metalsmiths have been creating a huge and almost invisible mount to hold the skeleton in a lifelike position, and yet allow any bone to be easily removed for study. In all, some 30 000 hours work has been put in on this skeleton. For nearly 2 years, preparators have stripped off the rock from the fossil bones, and recreated some of the missing bones. Palaeontologists have analysed and described the specimen. A CT scan team have used powerful x-rays to dissect the bones without trace. A seven movement classical work has even been composed by Bruce Adolphe – commissioned by the Chicago Chamber Musicians. Books have been written – fiction and non-fiction. The specimen has been mounted on a base which mimics shattered rock, with Sue crouched and turning slightly, as if in the middle of eating something when startled by the viewer. The pose creates tension – a relationship between the viewer and Sue.